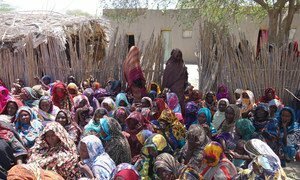 A group of people displaced from Blargui village on Lake Chad, found refuge in the Kafia site, hosting internally displaced persons. “Many people have lost everything. Hundreds of thousands of women and children continue to bear the brunt of the Boko Haram violence,” UN Under-Secretary-General for Humanitarian Affairs and Emergency Relief Coordinator Stephen O’Brien said of the grants to support humanitarian partners in Nigeria, Cameroon, Chad and Niger. The funds from the UN Central Emergency Response Fund (CERF), set up 10 years ago to provide immediate financing for both sudden-onset and long-festering crises, will provide life-saving aid to almost 1.7 million people who are in urgent need of food, drinking water, shelter, health care, protection and education. “Saving lives and protecting people in the region is at the centre of the humanitarian response,” Mr. O’Brien said earlier in the week. Some $10 million will bolster relief efforts in Nigeria, while humanitarian partners in Cameroon, Chad and Niger will receive $7 million each. Women and girls kidnapped by Boko Haram have been subjected to physical and psychological abuse, forced labour, forced marriage and sexual slavery. Boys have been forcibly enrolled as combatants. Humanitarian agencies will use CERF funds to support urgently needed protection including prevention of and response to sexual and gender-based violence in the four countries. In Nigeria, CERF funding will also be critical for providing emergency shelter, health care, safe drinking water and sanitation and nutrition for people living in overcrowded camps in the north east of the country. In Cameroon, Chad and Niger, it will allow improved access to shelters, reproductive health care, safe drinking water and sanitation in camps for displaced, host communities and schools. The region also suffers from chronic food insecurity and under-development, and the funds will provide food, supplementary feeding and nutritional support to people facing severe hunger as insecurity continues to have a negative impact on livelihoods, food security, and nutrition. Since its inception in 2006, 125 UN Member States and Observers, private-sector donors and regional governments have supported CERF, which has allocated almost $4.2 billion in support of humanitarian operations in 94 countries and territories.